# This experiment was performed in the Oncology Key Lab of the Department of Higher Education of Heilongjiang Province Institution of Higher Education. * These authors contributed equally to this work and should be considered co-first authors. Background: Follicular lymphoma (FL) frequently develops drug-resistance and transforms into more aggressive subtypes over time. It is urgent to find prognostic biomarkers and disclose signaling pathways that have potential to be drug targets. In this study, we investigated the association of FL prognosis with the expression of 2 proteins: PIK3CD, a PI3K pathway component, and CD9, a tetraspanin family member. 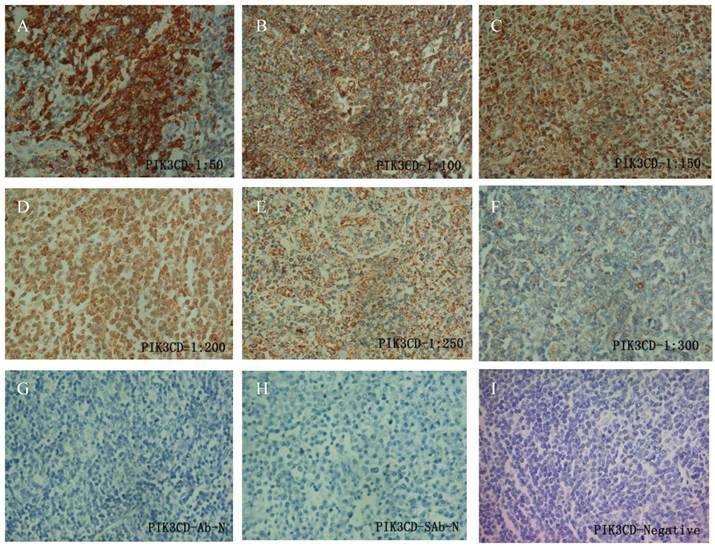 Method: The expression of PIK3CD and CD9 were examined on 76 FL tumor tissues and 15 normal tissues with Immunohistochemistry. Chi-square test, Cox proportional hazards model, and Kaplan-Meier estimates were used to analyze the relationships of CD9 and PIK3CD expression and major clinicopathological features. Result: PIK3CD expression was significantly higher, whereas CD9 expression was significantly lower in the 76 FL specimens than normal tissues. Concomitantly, low CD9 or high PIK3CD expression is associated with high degrees of Ann Arbor stages. In agreement with this, PIK3CD is an unfavorable and CD9 is a favorable factor for progression-free survival (PFS). Interestingly, PIK3CD expression is negatively correlated with CD9 expression, and the PIK3CD-high/CD9-low was significantly associated with short PFS when the 2 factors were combined together. Lastly, CD9 expression was significant higher in patients with bone marrow infiltration (BMI) than those without BMI. Conclusion: Both CD9 and PIK3CD are prognostic markers of FL. The negative correlation between CD9 and PIK3CD expression suggests that there may be crosstalks of the 2 proteins in FL. Follicular lymphoma (FL) is the most common indolent B-cell non-Hodgkin's lymphoma, generated from germinal center B cells . It is characterized by the relatively low malignancy degree, slow progression and high response rates to therapy, such as rituximab [2-4]. However, FL is a heterogeneous disease and presents variable outcomes. About 30-40% FL will undergo a histological transformation and develop into more aggressive lymphomas, such as diffuse large B cell lymphoma (DLBCL). Consequently, this population of FL will have a poor outcome due to increasing drug resistance and multiple relapses [2, 5-8]. After comparing 12 FL samples and their counter parts of DLBCL by microarray, Lossos IS et al found that no single genes are subject to the same changes during disease progression . These results suggested that FL progression is complicate and may need multiple alternative mechanisms. Therefore, stratification of FL subpopulations is required to evaluate their clinic outcomes, and more biomarkers are in need to identify the subpopulations with poor prognosis. In B cells, B-cell antigen receptor (BCR) is a ubiquitous surface protein. BCR signaling regulates multiple B cell biological functions, such as growth, proliferation, differentiation and survival [10-13], thus it is a key element of B-cell survival and lymphomagenesis . Intracellular signal transduction of BCRs is almost invariably dependent on phosphoinositide 3-kinase (PI3K) signaling . PI3Ks catalyze the production of lipid second messengers in cells, primarily phosphatidylinosital 3,4,5-trisphosphate (PIP3) [16, 17]. The class I PI3Ks are composed of a regulatory subunit and a p110 catalytic subunit. There are 4 isoforms of the catalytic subunits of Class I PI3Ks: PIK3CA, PIK3CB, PIK3CG, and PIK3CD, of which PIK3CD (also named with PI3Kδ, p110δ) is primarily expressed in leukocytes and may account for 60% of PI3K activity in B cells [18-20]. Ablation of PIK3CD in mice blocks pro-B cell differentiation and decreased numbers of mature B cells in the circulation, suggesting an indispensible role in B-cell follicular maturation and survival. Inhibitors that block pan-PI3K or PIK3CD activity have shown promising results in animal experiments or clinic trails for treatment of variable lymphoma including FL and lymphoid and myeloid leukemia [17, 21, 22]. Though class I PI3K aberrancy has been frequently implicated in many forms of B-cell malignancy, such as chronic lymphocytic leukemia (CLL), mantel cell lymphoma (MCL), and DLBCL, it is not well studied in FL . In FL, a subset of patients shows activation of PI3K, demonstrated by phosphorylation of Akt, a downstream kinase of PI3Ks [21, 24]. However, it is not clear whether PI3K pathway activity is associated with FL prognoses. Proper BCR signaling also requires Bruton tyrosine kinase (BTK) whose activation is dependent on the production of PIP3 by PI3Ks. One of Btk targets in B cells is CD9, identified by Btk mutant and knockout mice . CD9 (also known as motility-related protein-1, MRP-1) is a 24-kDa cell membrane glycoprotein that belongs to the tetraspanin family characterized by 4 transmembrane domains . Partnering with integrins, immunoglobulin superfamily receptors, and other tetraspanin proteins, CD9 forms specialized membrane microdomains on the cell surface and transduces extracellular signals inside to promote apopotosis, suppress metastasis, and modulate cell adhesion [27-31]. Indolent B lymphoma cells depend on the interaction of CD9 and follicular dendritic cells (FDC) to survive . However, when the disease progresses, tumor cells lose CD9 expression and bypass the pathway [24, 25, 32, 33]. Although reduced CD9 expression was associated with less favorable prognosis in multiple cancers [34-36], it still remains elusive whether CD9 plays a role in FL progression. In this study, we examined the expression of PIK3CD and CD9 in FL to investigate their relationships with FL prognoses. We found both CD9 and PIK3CD expression are associated with FL prognoses, and their expression is negatively correlated in FL. Formalin-fixed paraffin-embedded FL sections were obtained from The Third Affiliated Hospital of Harbin Medical University. The patients were firstly diagnosed as FL without any severe systemic disease or combined tumor between October 2006 and May 2013, and didn't receive any treatment before diagnosis. Patients were excluded from the study if they could not bear first-line chemotherapy due to pregnancy, breast feeding, or poor compliance, or if they were less than 18 years of age. Total 76 surgical FL samples were collected. The cohort includes 32 males and 44 females, and the average age of these patients is 50.90 (ranged from 25 to 76). According to Ann Arbor Stages, 29 were in stage I or II, 47 in stage III or IV. Stage IV contains 24 patients, and all of them had bone marrow infiltration but not other extra-nodal organs infiltration. The progression-free survival (PFS) ranged from 4 months to 35 months, and average PFS was 16.3 months. Randomly-selected 15 normal samples during the same period were used as controls. This study was conducted with approval from the Ethics Committee of the Third Affiliated Hospital of Harbin Medical University. Four micrometers of paraffin sections were used for immunohistochemical staining. They were dewaxed, incubated in saline sodium citrate (pH = 7.0) for 2 min in pressure heating environment for antigen retrieval, then soaked in 3% H2O2 solution for 25 min. Rabbit monoclonal CD9 antibody or mouse monoclonal PIK3CD antibody (both purchased from OriGene Technologies, Maryland, USA) was applied overnight with a dilution of 1:200 at 4°C, and the sections were incubated with secondary antibody at room temperature for 25 min, then visualized by DAB. The stained specimens were reviewed by two pathologists independently. At least five visual fields were observed for each section under high power lens (400X) to calculate the percentage of positive cells. The sections were then scored semi-quantitatively for CD9 as the following criterions: classified as 0 ( < 10%), 1(10% to 20%), 2 (20% to 30%), 3 (30% to 40%) and 4 ( > 40%); intensities were classified as 0 (no staining), 1(weak staining), 2 (distinct staining), and 3 (strong staining). Specimen with a total score (percentage score multiplied intensity score)>3 were classified as CD9-positive (+), otherwise were CD9-negtive (-). PIK3CD was scored as same intensity criterion as CD9, but the 0 and 1 scores were classified as PIK3CD-negtive (-), 2 and 3 scores as PIK3CD-positive (+). All the data were analyzed with SPSS20.0 software and chi square tests were used to compare the differences of the CD9 and PIK3CD expression between the FL and the normal tissues. The correlations of the CD9 and PIK3CD expression levels were also analyzed using chi square tests. Survival curves were generated with the Kaplan-Meier method, and Cox's proportional hazards regression model was used to evaluate the hazards. Differences with P < 0.05 were considered statistically significant. To determine the working condition and the specificity of PIK3CD antibody, we did IHC with a series of antibody dilutions (Fig. 1). We also included specimens treated without either primary PIK3CD antibody or the secondary antibody as negative controls (Fig. 1G&H). After confirm the specificity of the antibody, we examined the PIK3CD expression in the patients samples. PIK3CD IHC signals were mainly present in the cytoplasm, similar as previous reported [37, 38] (Fig. 1). In the cohort, 75.0% male and 72.7% of female patients, as well as 76.0% of more than 60 years old and 72.5% less than 60 years old patients showed PIK3CD high expression (Table 1). There were no significant differences of PIK3CD expression among FL patients with different genders and ages. Nevertheless, when comparing with normal controls, of which 26.67% (4/15) showed positive PIK3CD staining, 73.68% (56/76) of FL patients presented PIK3CD positive staining (Fig. 3A, Table 1). This result indicates that PIK3CD and PI3K pathway is constantly activated in FL patients. IHC of PIK3CD in FL patients. A series of PIK3CD antibody dilutions were used to determine the specificity of the antibody: A, 1:50; B, 1:100; C: 1:150; D, 1:200; E, 1:250; F, 1:300. Sections without primary PIK3CD antibody (G) or without secondary antibody (H) were used as negative control. A representative PIK3CD negative patient (I) was also shown. The expression of CD9 and PIK3CD in 76 FL patients and their association with clinicopathological features. When comparing different clinicopathological characteristics, PIK3CD expression didn't differ between groups with pathological Stages or Follicular Lymphoma International Prognostic Indexes (FLIPI) (Table 1). However, PIK3CD expression is significantly higher in patients of Ann Arbor stages III to IV (77.6%, 38/47) than stages I to II(69.0%, 20/29) (Table 1). More importantly, PIK3CD expression is negatively related with the length of progression-free survivals (PFS) (Fig. 4A). The median PFS of the PIK3CD(+) patients was 12.5 months with a range from 4 month to 34 months, whereas the median PFS of the PIK3CD(-) patients was 24 months with a range from 12 month to 35 months (P<0.001, HR=2.829, 95.0% CI: 1.634-4.897) (Fig. 4A). Similarly as PIK3CD antibody, we first tested CD9 antibody with a series of antibody dilutions and proper negative controls, then we determined CD9 expression in our patient samples (Fig. 2). As previously reported, CD9 mainly exists on the cell membrane, but cytoplasmic signals were also observed  (Fig. 2). Similarly as PIK3CD, CD9 expression didn't differ according to the genders or ages, with 25.0% male and 34.1% of female patients, as well as 28.0% of more than and 31.4% less than 60 years old patients showing CD9 high expression (Table 1). However, CD9 expression was significantly reduced in FL patients comparing with normal controls. In the normal tissues, 66.67% (10/15) of specimens were categorized to CD9(+) according to the methods described above while the positive rate of CD9 in FL was only 30.26% (23/76) (Fig. 3B, Table 1). Although CD9 expression didn't show statistical differences in groups of pathological stages and Follicular Lymphoma International Prognostic Index (FLIPI) (all P>0.05), its expression is significantly lower in the Ann Arbor Stages III to IV than stages I to II groups (Table 1). Thirty-four point five percent of (10/29) patients were CD9(+) in the Ann Arbor Stage I to II group whereas only 27.7% (13/47) patients were CD9(+) in Ann Arbor Stages III and IV (P=0.009) (Table 1). 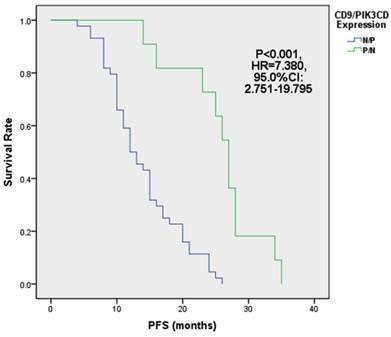 More importantly, reduced CD9 expression predicted shorter PFS (Fig. 4B). PFS of CD9(+) patients ranged from 4 months to 35 months, and the median PFS was 19 months. Meanwhile, PFS of CD9(-) ranged from 4 month to 26 months and the median PFS was 15 months (P=0.001, HR=0.385, 95.0% CI: 0.241-0.693) (Fig. 4B). These results suggested that CD9 expression negatively correlated with FL prognostic outcomes and may be attributed FL progression. There are evidences that suggested CD9 and PI3K pathway crosstalks [25, 40]. Therefore, we analyzed the correlation between CD9 and PIK3CD expression. Inside the cohort, CD9 and PIK3CD expression were categorized 4 groups: the CD9(+)/PIK3CD(+) group, which contained 15.8% (12/76) patients; the CD9(+)/PIK3CD(-) group which contained 14.5% (11/76) patients; the CD9(-)/PIK3CD (+) group which contained 57.9% (44/76) patients; and the CD9(-)/PIK3CD(-) group which contained 11.8% (9/76) patients (Table 2). From table 2, we can see when PIK3CD expression is high (totally 56 cases), CD9 expression is always low (44/56). On the contrary, when CD9 was low (totally 53 cases), PIK3CD expression is always high (44/53). Statistical analysis revealed that CD9 expression was negatively correlated with PIK3CD expression in FL (p=0.005, R=-0.322 ). Next, we analyzed the PFS of above 4 groups of patients. Our results showed that the median PFS of CD9 (+)/PIK3CD (-) group is 27 months (ranged from 14 to 35 months), while that of CD9 (-)/PIK3CD (+) group is only 12.5 months (ranged from 4 to 26 months). The CD9(+)/PIK3CD(-) group has a significantly longer PFS than CD9(-)/PIK3CD(+) group (p<0.001) (Fig. 5). In multivariate analysis using cox risk regression model, we had not gotten useful data for CD9 or PIK3CD as an independent predictor for FL prognosis. Bone marrow infiltration is a sign of metastasis, and associated with bad prognosis [41, 42]. Next we analyzed the relationship of CD9 and PIK3CD expression with FL bone marrow infiltration. In the cohort, all 24 Ann Arbor Stages IV patients were in hematopathy phase showing bone marrow infiltration at the first diagnosis, but were absent of other extra-nodal organs infiltration. Surprisingly, we found that CD9 expression was significantly higher in patients with bone marrow infiltration (45.8%, 11/24) than those without bone marrow infiltration (23.1%, 12/52) (P=0.045) (Table 3). Although CD9 expression is significantly correlated with PIK3CD expression, PIK3CD expression didn't associate with the status of bone marrow infiltration (P=0.461, Table 3). IHC of CD9 in FL patients. A series of CD9 antibody dilutions were used to determine the specificity of the antibody: A, 1:50; B, 1:100; C: 1:150; D, 1:200; E, 1:250; F, 1:300. Sections without primary CD9 antibody (G) or without secondary antibody (H) were used as negative control. A representative CD9 negative patient (I) was also shown. The expression of PIK3CD (A) and CD9 (B) is associated with PFS in FL. FL patients with low CD9 and high PIK3CD had worse PFS. FL is the most common indolent B-cell lymphoma with various outcomes . The heterogeneity of FL makes it difficult to predict its outcomes . Therefore, prognostic markers are needed for better diagnosis and treatment. BCR signaling pathway play very important roles in B cell development, transformation and FL progression. Upon activation, BCR signaling transmits extracellular stimuli into cells via activation of PI3Ks, and subsequently phosphorylates Akt and Btk . PI3K activation has also been observed in a FL animal model, but it has not been well studied in patient samples. Akt expression has been observed in all FL samples and phosphoryation of Akt occurred in 37% (14/38) cases in a small cohort . However, whether PI3K activation can be a prognostic marker is still not inclusive. PIK3CD is the predominant isoform of PI3Ks in B cells . Here we examined PIK3CD expression in FL samples and found it was overexpressed in FL patients comparing with normal controls (Fig. 3A). Its overexpression was associated with high degrees of Ann Arbor stages (Table 1) and short PFS (Fig. 4A). These results proved that PI3K pathway play very important role in FL progression and can be used as a prognostic marker for FL. 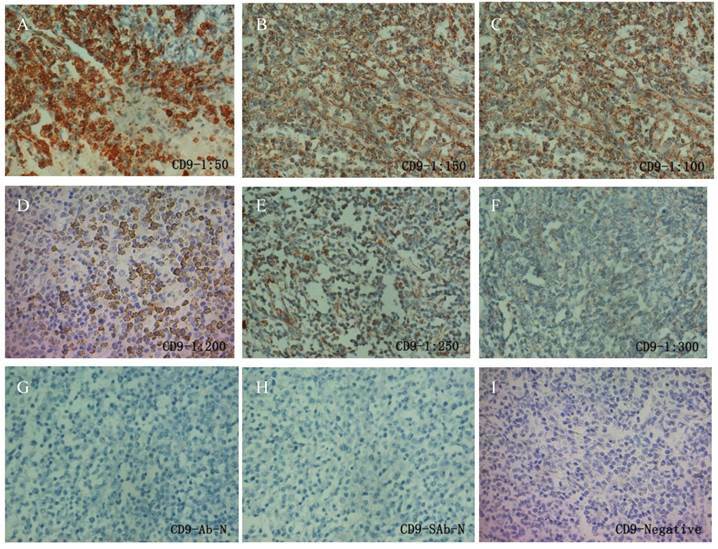 CD9 is a cell surface protein whose expression has been negatively correlated with prognostic outcomes in multiple cancers. It facilitates germinal center B cells interaction with FDCs, thus promote FDC-dependent survival of B cells. When B lymphoma cells progress and become FDC-independent, CD9 expression is reduced or lost . Decreased expression of CD9 is more resistant to apoptosis. Nevertheless, whether CD9 expression contributes to FL progression is not well studied. In this study, we have shown that CD9 expression is reduced in FL patients (Fig. 3B) and patients with the reduced CD9 levels had higher degrees of Ann Arbor stages (Fig. 4B) and shorter PFS than those with high level CD9 (Table 1). Our results agree with previous discoveries and suggested that CD9 may play an important role in FL progression. Surprisingly, we found CD9 overexpression is associated with bone marrow infiltration although in other solid cancers CD9 down-regulation was more often seen in metastatic lesions [28, 45, 46] (Table 3). The mechanisms behind this phenomenon remain elusive. It has been shown that CD9 positive B-acute lymphoblastic leukemia cells displayed cancer stem cell properties, including asymmetric division, self-renewal and drug resistance . The association of CD9 and bone marrow infiltration may reflect this aspect of CD9's functions. It is possible that CD9 expression can predict different clinicopathological features due to its multiple facets of functions. On the other hand, the sample size of bone marrow infiltration FL is limited, so this phenomenon needs a further investigation. We also found that PIK3CD expression is negatively correlated with CD9 levels in FL patients (Table 2), and PIK3CD(+)/CD9(-) patients have significantly shorter PFS (Fig. 5). These results suggested that PIK3CD and CD9 combination may be a better prognostic marker for FL. The regulatory networks of PIK3CD and CD9 are not well studied. In mast cells, CD9 is an alternative IL-16 receptor and can activate PI3K pathways . Another study using mouse models have shown CD9 expression was markedly reduced in normal B cells after Btk ablation, an important mediator of PI3K pathways . Our observation does not agree with these results. The negative-correlation of CD9 and PIK3CD expression suggests that the regulatory network of these 2 proteins are complicated and their molecular functions in FL need further investigations. In summary, we have shown that FL patients expressed high levels of PIK3CD and low levels of CD9. The upregulation of PIK3CD and downregulation of CD9 are associated with higher Ann Arbor stages and short PFS, respectively. However, CD9 expression may also promote FL bone marrow infiltration in Ann Arbor Stages IV patients. Concomitantly, PIK3CD expression negatively correlated with CD9 expression, and the CD9(-)/p110(+) group have the shortest PFS. These results suggested that the loss of CD9 and gain of PIK3CD increases the risk of FL patients recurrence, thus CD9 and PIK3CD are good predictors of tumor progression or aggressiveness of FL. This study was supported by grant 81472636 from National Natural Science Foundation of China, the Department of Medical Oncology of the Third Affiliated Hospital of Harbin Medical University, Harbin, China, and the Tumor Research Institute of Heilongjiang, Harbin, China.